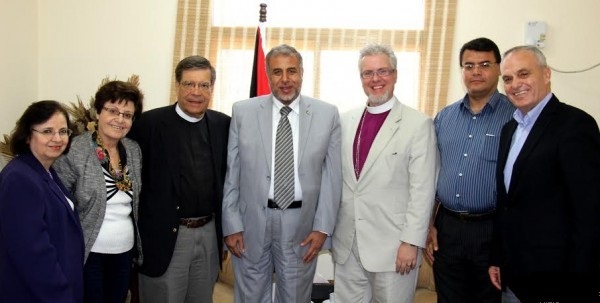 Gaza, Al Ray - Physicians from the US-based Anderson Cancer Institute discussed Sunday with the minister of health the establishment of a cancer treatment unit at Al-Ahli Arab Hospital in Gaza. Soheela al-Tarazi, Maher Ayyad and Sameera Farah from the hospital accompanied the delegation. Public Relations at the ministry reported that the American delegation, hosted in Gaza and spondered by Al-Ahli Arab Hospital,consisted of Andy Charlie and John Patterson. They proposed to establish a radiation oncology center at the Al-Ahli Arab Hospital, the ministry said. Al-Ahli Arab Hospital was originally a medical work established in the late 1800s by the Church Missionary Society (CMS), and then developed into a hopital after the World War 2. Dr. Makhalalati expressed his interest and full support of the project, saying that Gaza does not have any specialized cancer treatment facility, which leads the cancer patients to seek treatment outside. However, he said some citizens are not allowed to travel abroad for medical care due to the continued blockade imposed on Gaza, which might cause severe complications to them. Ministry of Health issued in February 2013 a statement which confirmed that deaths resulting from cancer in Palestine amounted to 12.4%, compared to a rate of 10.8% in 2010. Al-Mezan Center for Human Rights issued in June 2012 a statement indicated that 12.4% of the total deaths in the Gaza Strip were caused by cancer.